This is the Limited Edition Weber Master-touch 57cm which has three differences to the standard Master-touch; a stainless steel grill, a Limited Edition thermometer and new wheels. why are Webers worth the extra cash: build quality ? Yeah, I didn't get it until my wife got me.one for my birthday and also a weber cooking course. I used to have a 3 burner gas bbq, and loved it but all i was doing was grilling outside. The weber is just in a different league build wise to other kettle bbqs, and pretty much bullet proof. Last few weeks I've done 9 hour smoked pulled pork, Morrocan lamb, the best rib eyes I've ever tasted etc etc. Honestly the taste you get off this is insane. I'm using woods to smoke, and trying all sorts of stuff. Very rare to have a sausages and burger bbq nowadays. Even done chocolate and bacon brownies in it. I see it as a new way to cook anything and you can buy tonnes of accessories for it. I've already got the wok and done smoked.mac and cheese, and I have a 3rd party pizza oven attachment. i am after a bigger bbq and love current webber but still over 200 ouch. Bought one of these though not the limited edition, top BBQ which will last for years and the chimney starter set is a Godsend!! this or the napoleon rodeo pro? Have this and absolutely love it. Best kettle you can get short of the eggs. 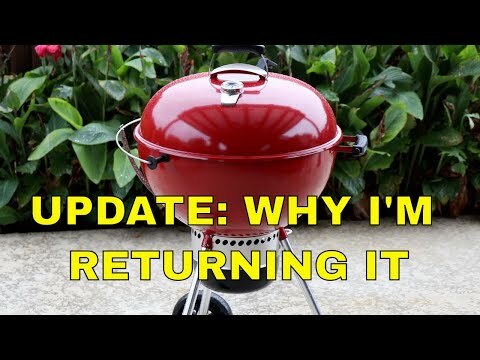 I've had my weber onetouch 10 years now and its still like new with regular use. Replaced the grate recently for a stainless steel GBS one (like the one with this model) and fully expect it to last another 10 years. It stays outside year round, I've had 2 covers for it that have dropped to bits yet the BBQ remains perfect, might not bother with the covers anymore. Not totally different, some people aren't fussed about whether BBQ is gas or charcoal and some people are fussed. Apparently not as good for smoking because the vent is right in the middle rather than offset. Napoleon all the way. Weber have been cheaping out recently. With a cheap BBQ, like most things, you get what you pay for. If you're fine with just using it for 1 maybe 2 seasons, that's great. Or if it's not going to get a lot of use. If you plan on really using it then premium BBQs are the way to go. 10 and 15+ year warranties are common. The quality of cooking and time saved can really make a difference. Weber and Napoleon may be expensive but I know Napoleon have superb features and warranties on their products. Their gas BBQs are out of my league now, sold the Napoleon for quick funds. I'll be settling soon with a Grill stream and it's measly 10 year warranty. To me, that works out 60 quid a year. Build quality, for sure. Look at the warranties. Napoleons equivalent has A 10 year warranty with a very solid, heavyweight cast iron cooking surface. I've gone off Weber's of late, their prices are very high but features and quality have slipped a little. I now know someone who sells BBQs and he won't touch theirs anymore. They look amazing but other grills that are far cheaper are beating them quality wise. Apparently one of their reps even admitted production has been shifted to China on some things and quality has dipped. With the charcoal, I don't think you could go wrong with something like this or the rodeo pro. Not much these days come with such long warranties. Awesome colour and of course it's Weber the best!. There was a batch from last year 2017, that had 'Porcelain coating issues' very unWeber normally perfect out the box. So if you do buy, inspect before assembly. 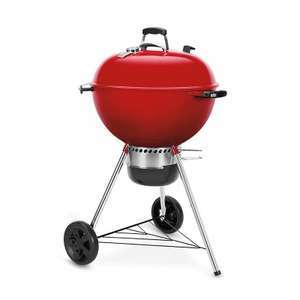 Riverside top notch Weber main agent. They do. Had my Weber 57 for £60 from B&Q few years ago. Thanks for Posting - Ordered! Not totally different, some people aren't fussed about whether BBQ is gas …Not totally different, some people aren't fussed about whether BBQ is gas or charcoal and some people are fussed. Gas is just cooking outside. It's not BBQ in my opinion. Lacks that charcoal and/or wood flavour. Plus you can hot smoke, which is impossible with GAS. Anybody interested in doing BBQ rather than just cooking food outside is absolutely going to care about getting a charcoal BBQ. Build quality, for sure. Look at the warranties. Napoleons equivalent has …Build quality, for sure. Look at the warranties. Napoleons equivalent has A 10 year warranty with a very solid, heavyweight cast iron cooking surface. I've gone off Weber's of late, their prices are very high but features and quality have slipped a little. I now know someone who sells BBQs and he won't touch theirs anymore. They look amazing but other grills that are far cheaper are beating them quality wise. Apparently one of their reps even admitted production has been shifted to China on some things and quality has dipped.With the charcoal, I don't think you could go wrong with something like this or the rodeo pro. Not much these days come with such long warranties. who would your BBQ selling mate reccommend? What pizza attachment did you get? Expired now but luckily I work right nearby and managed to pick one up just now. Hope it's good. Thanks man - just ordered. The two things I was on the hunt for have …Thanks man - just ordered. The two things I was on the hunt for have appeared within days of each other...I might be £500 out of pocket but I now own a Weber Mastertouch and an Xbox One XHappy summer indeed! and no ££ left for meat or coal or xbox games. Gas is just cooking outside. It's not BBQ in my opinion. Lacks that …Gas is just cooking outside. It's not BBQ in my opinion. Lacks that charcoal and/or wood flavour. Plus you can hot smoke, which is impossible with GAS. Anybody interested in doing BBQ rather than just cooking food outside is absolutely going to care about getting a charcoal BBQ. Fair enough, some want to just cook outside with the family. Expired now but luckily I work right nearby and managed to pick one up …Expired now but luckily I work right nearby and managed to pick one up just now. Hope it's good. Yeah price for the Limited Edition has gone back up to £235. Glad a few of us managed to pick one up at the cheaper price. Riverside do have a smoke grey standard Master-touch for £209, but that doesn't come with the fancy grill or wheels. Alright I'm completely unsure about this BBQ stuff but I mean I bought a kettle BBQ, one of the cheap brands, from b&Q clearance sale for £20. I don't understand how these Weber ones are that good? I mean at the end of the day it's just the coals that are heating your food up either way?